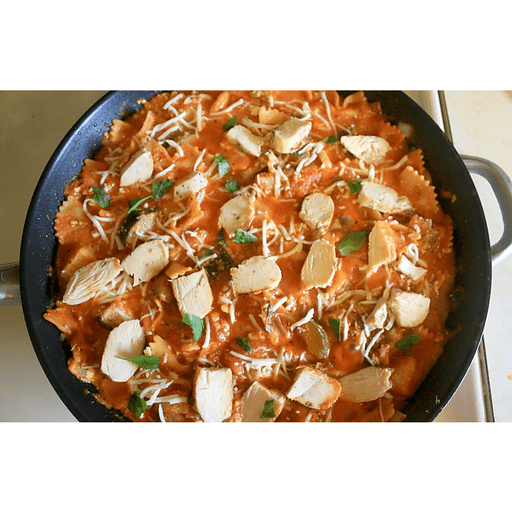 This Cheesy Chicken Skillet Lasagna is made with a blend of three cheeses and some of our favorite veggies. Bonus: It's a one pot dish that requires very little prep work and even less clean-up! 1. Heat canola oil in a large skillet over medium-high heat. Add zucchini, onions and mushrooms to the oil and begin to sauté for five minutes or until slightly tender. 1. Over the vegetables, evenly spread cottage cheese, parmesan, and ¾ cup shredded mozzarella. 1. Layer uncooked pasta over the cheese. 1. Layer pasta sauce and diced tomatoes over the uncooked noodles. 1. Tightly cover the pan (if you do not have a lid that will fit, tightly cover with tin foil) and simmer over medium-low heat for 15-20 minutes or until the pasta is cooked. 1. Sprinkle with remaining mozzarella and layer with sliced, grilled chicken. Serve warm. Calories 390, Total Fat 12g (Saturated 4g, Trans 0g), Cholesterol 55mg, Sodium 820mg, Total Carbohydrate 38g (Dietary Fiber 5g, Sugars 10g), Protein 33g, Vitamin A 15%, Vitamin C 40%, Calcium 25%, Iron 20% *Nutritional values are an approximation. Actual nutritional values may vary due to preparation techniques, variations related to suppliers, regional and seasonal differences, or rounding.